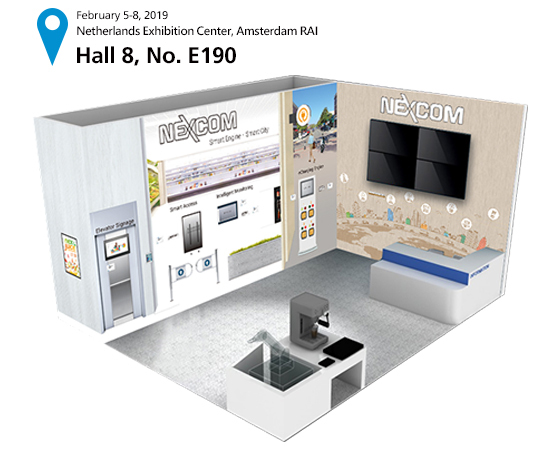 You are cordially invite to visit NEXCOM Booth at Stand 8-E190 in 2019 Integrated Systems Europe exhibition which will take place from February 5th to 8th in Amsterdam. The world of professional AV and systems integration comes together every February at Integrated Systems Europe – and we’d like you to be a part of it. NEXCOM will show about the IoT connection of smart city. Welcome to contact us for making an appointment in advance and more product information. Please mark your calendar, reserve the time slot, and join the conference. We look forward to see you at Stand 8-E190 in Amsterdam.